I was bought Mirror's Edge for the PS3 for Xmas and I've been playing it very slowly. I think the game is really clever, and can be a lot of fun. But unfortuntely I find that it offers as much frustration as fun. I have to be honest, I've never ever played a FPS using a dual-analogue controller. So I felt very clumsy to begin with but I don't think it's a limitation for me now. Having said that, the overall controls and gameplay feels more like you are rolling a dice than mastering a game. For the most part, running and jumping is great. I have a hard time maintaing momentum but I know this is because I don't know the levels and I haven't played enough. But at times you know you have to jump across at a certain point but getting across isn't so obvious. During these times I'll die tens of times. Although, to be fair, this is something I can improve at, but it's still extremely frustrating. The worst and most hair-pulling part is when you have to take on armed foes. Getting pass these parts is when I die seemingly countless times. Taking out a foe with a pistol is relatively fun and easy. You have plenty of time to disarm these guys. But the guys with shotguns and machine guns are almost impossible to disarm. You only have a split-second to press the disarm button and I don't know how anyone could ever get it right more than 50% of the time. And if you miss you're dead. You can slow down time to so you can do it more easily, but even then, I find myself responding the foes movements rather than when his weapon turn red to indicate when he can be disarmed. His arm moves over his head to attempt to pistol-whip me, and that's when I press the disarm button, which is too early and then I'm as good as dead. The ability to slow down time is very limited and doesn't build up until you start running around, and you can't run much after disarming the first guy before the next five have shot you dead. Oh, and it only takes a few hits to kill you, so whilst sometimes you can run away, often you'll have to run directly at a firing weapon and just hope the guy is sucky shot. 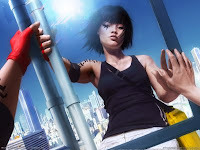 I'm sure there are ways I can improve, and in that regard I wish Mirrors Edge had better training levels where you could practice and master the controls. The first level introduces what each button does, hints about some of the techniques, slaps you on the arse and sends you on your way. After that, you die so quickly you really don't get a chance to learn the more advanced techniques that might help. I do actually enjoy the game, in that I want to play it. But I only play one level at a time. Any more than that and I know I'm putting my plasma at risk of becoming a target for the PS3 controller.